Update, February 2011: Complete re-write. Real-time raytracing of triangle meshes - my 70$ GT240 renders a 67K triangles chessboard with reflections and shadows at 15-20 frames per second. Interactive navigation and rendering mode changes are allowed (see video below). Overall, compared to the pure C++/OpenMP version, the CUDA implementation runs 10 times faster. A Bounding Volume Hierarchy using axis-aligned bounding boxes is created and used for ray/triangle intersections. The BVH is created via the surface-area heuristic, and is stored for fast re-use. If SSE are available, a SIMD implementation is used that builds the BVH faster. CUDA 1.2 cards like my GT240 have no support for recursion, so I used C++ template magic to implement compile-time recursion - see cudarenderer.cu in the source tarball for details. C++ template-based configuration allows for no-penalty runtime selection of (a) specular lighting (b) Phong interpolation of normals (c) backface culling (e.g. not used in refractions) (d) reflections (e) shadows (f) anti-aliasing. Z-order curve is used to cast the primary rays (Morton order) - significantly less divergence => more speed. Vertices, triangles and BVH data are stored in textures - major speed boost. The sources (latest version: 2.1h, April 2011) of this new raytracer are available from here, and Win32 binaries are also available (compressed with 7-zip). I also included MSVC project files, to make builds under Win32 easier. January 30, 2011: Complete re-write, now using Bounding Volume Hierarchy for acceleration of ray/triangle intersections. A C++ template generates a set of CUDA kernels, with selectable different features: reflections, Phong normal interpolation, shadows, Specular lighting, backface culling, anti-aliasing etc. January 9, 2011: Added loading of .3ds/.ply models, help screen and Win32 binaries. January 7, 2011: Optimal number of threads per block, and re-written kernel for better coalescing - the "train" object (seen in the new uploaded video) now spins at 21.5 fps on my GT240. At work, I recently had an opportunity to implement a project with CUDA, and results were excellent: Execution of the code presented a remarkable 30-40x speedup. After testing the waters with a simple Mandelbrot implementation, I was eager to apply CUDA to my life-long obsession: my SW-only renderer. What happened then was interesting, so I decided to document it. And no, the text below is not about graphics. It is about taking a set of algorithms (that simply happen to be graphics algorithms) and trying to implement them in CUDA. Let me say this again: I know all about OpenGL and the shadow ARB extension, but this post is NOT about graphics. It is about a more generic question: "I have an algorithm. Will CUDA/OpenCL/DirectCompute help me execute my algorithm faster"? My GT240 offers hundreds of GFlops, so things looked promising. First attempt - can I do rasterizing? 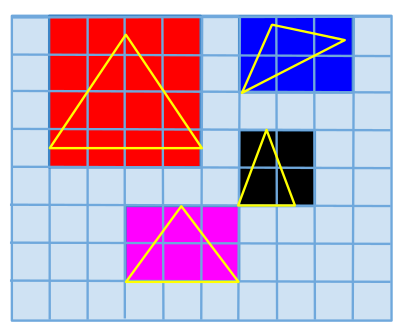 For those of you that are not into graphics, the key point is this: the algorithm tries to optimize the necessary computations, by taking advantage of the fact that neighbouring pixels of a rasterized triangle are "related": it computes some data on the 3 vertices, and linearly interpolates these values per-pixel, instead of re-computing them on each pixel (Which is what a raycaster/raytracer does). This means, that for each pixel plotted during the rasterization of the triangle, the algorithm has to check the Z-Buffer, to see if the point is indeed the closest one to the screen. That is, we have one access per pixel to the Z-buffer. And when we are doing shadow mapping, we are also doing another access per-pixel, to the shadow buffer. This is the first point where I hit a wall: when doing many accesses in a big enough buffer in a RANDOM access pattern, CUDA loses all its speed advantages. Why? because the "global" memory (in CUDA terms) is too slow to allow multiple threads to read/write wherever they want. It has no cache! Things are OK if your algorithm performs sequential accesses. The memory coalescing mechanisms can greatly help in that case. But if your algorithm is generating "random" offsets in its read/write requests - just like triangle rasterizing does, when concurrently executed by one thread per triangle - then your speed becomes... glacial. I tested this, and found out that CUDA was... 3 times slower than my CPU, in a window one quarter the size! You can survive this if you can adapt your algorithm to work in the small - but fast! - thread-shared memory (16K in the case of my 70$ GT240). Unfortunately, rasterizing can't be (easily) shoe-horned into this: I tried splitting the screen into tiny "screens" (32x32), small enough to fit into the shared memory, and rasterize the triangles inside them. And indeed, the rasterizing speed of each tiny "screen" became much faster - but I had GRIDxGRID such tiny screens now, and to display the complete screen I had to invoke the CUDA kernel GRIDxGRID times. Resulting speed: 10 times slower than the CPU rasterizer! Executive summary: the rasterizing algorithm is fine for a CPU implementation, but at least in its plain form (one CUDA thread per triangle), it doesn't seem to fit the CUDA model. Second attempt - what about raycasting? Now notice that this algorithm works per-pixel. We only pass over each screen pixel once (in sequence) and doing a bunch of calculations that involve reading the triangle data (in sequence). Which means that memory accesses are far more sequential than in rasterizing. A number of hours after I realized this, I had finished coding a Phong raycaster, which was 15 times faster than its C++ equivalent! The video linked near the end of the page shows a run of the C++ version, followed by a run of the CUDA version - notice the frames per second reported in these first two runs, where a "dragon" object made of 50.000 triangles goes from 1.3 frames per second (with C++) to 20 (with CUDA). (When considering these numbers, keep in mind that this is raycasting, not rasterizing: even the SW-only C++ version of my renderer will render the dragon with soft shadows at far more than 50 fps, but the comparison is not fair, since raycasting is a lot "heavier" than rasterizing). Update, one month later: The new implementation raytraces the dragon with reflections and shadows at 18 frames per second. Wow. To be fair, however, this speedup came at a price: The CUDA code is a lot more complex than the C++ code. The triangles are placed in "bin" lists. This allows me, when doing the raycasting, to only check the triangles that are in the pixel's "bin" list. What about the CUDA version? There are no std::lists, of course. I have to know how "deep" each bin list will go, so I do a first pass that does atomic increments in list counters, one per bin (1st CUDA kernel), while calculating each triangle's bounding box. I then do a parallel reduction (2nd CUDA kernel), to calculate the scene's bounding box. I then accumulate the counters in another kernel, to know the starting offset of each bin in the final bin list (3rd CUDA kernel). After accumulation, I know how deep each list will go, so I can allocate enough memory for all bins, and pass it to the placement kernel (4th CUDA kernel). I then do the raycasting (5th CUDA kernel), and I can then free the bin memory - and finally blit the rendered buffer. Phew. Which means I had to implement multiple passes over the data, and in fact implement algorithms that had nothing to do with my original problem. A good example is the parallel reduction I had to do, to optimally calculate the total scene bounding box. There were also difficult to debug race condition bugs - thank God for cuda-gdb. And it did provide a marvelous 15x speedup over the same algorithm in C++, so... yes, it definitely was. Just keep in mind that for many categories of problems, CUDA will force you to make your code a lot more painful, before rewarding you with speed. But that was not the end of it - after all, my rasterizer uses shadow mapping to create very nice-looking shadows. Could I reproduce the same 15x gains in the CUDA-based shadow-raycaster? No... I couldn't. Not at first. The moment I added the shadow ray casting, CUDA lost ALL its speed. It became slower than the C++ code! Was it the additional memory accesses that are now done per-pixel? Before, we were just checking the list of triangles in the "camera-space" bins, now we are also looking at the list of triangles in the "light-space" bins (the ones used for shadows). No, it was something different. I verified it by doing all the shadow-raycasting work... and then simply ignoring the boolean value "inShadow". And the speed returned! // and the threads diverge here: some will do Phong illumination, some wont. // (their result is ignored), the speed gets back to 20 fps! In the non-shadow version, the threads spawned by CUDA are executing more or less the same path. They follow the same "decision paths" in the ray-casting code. In the shadow ray mode, however, depending on whether the point is in shadow or not, the path followed per thread is completely different. "Branches in the program code do not impact performance significantly, provided that each of 32 threads takes the same execution path; the SIMD execution model becomes a significant limitation for any inherently divergent task." The second part of the video linked below shows how the CUDA raycaster became 30 times slower as soon as the shadow ray calculation was introduced. Update, one month later: After studying some papers, I implemented a different order in casting rays: instead of doing it in a nested loop that goes from top-to-bottom, left-to-right, I used the Z-order curve, also known as Morton order. This significantly reduced the divergence of the primary rays, and increased speed of primary rays by 30%. Next thing to try: ray packets! Naturally, this required the setup of the cameraBinsTexture, right after the ptrCudaCameraBins data had been calculated, and before the line above (from the raycaster kernel) was executed. I tried this change in many places - the cameraBins, the lightBins, even the pre-calculated cache of light-space normals and edge vectors that are used during the shadow ray intersections. To my disappointment, this improved speed only a little (the train object sped up by less than 3%). Update, one month later: The "bins" algorithm indeed showed little benefit from using textures. This however was not the case for the new implementation with the Bounding Volume Hierarchy: I used textures to store everything, the data for the vertices, the pre-calculated triangle intersection data, the inner and leaf nodes of the BVH tree... and the speed soared by more than 120% ! print "Running with", t, "threads and", b, "bins"
Notice that there is quite a difference between the top performing combination and the bottom one: from 1.9 to 10, i.e. more than a 5x. So this is also helping quite a lot. I used these values (128 bins, 128 threads per block) when creating the video with the train, on the top of this page. In the absence of cache, it is vital to have coalesced memory accesses. I changed the raycasting kernel to work on pixels in a specific order: the order of bins. In fact, by using blocks of threads that span an entire bin, the rays handled by a thread block will always "hit" the same bin. This means that accesses to the triangle list of each bin are now a lot more coalesced ... and speed was instantly improved by another 2x. And this is where I will stop working further with the "bins" algorithm. 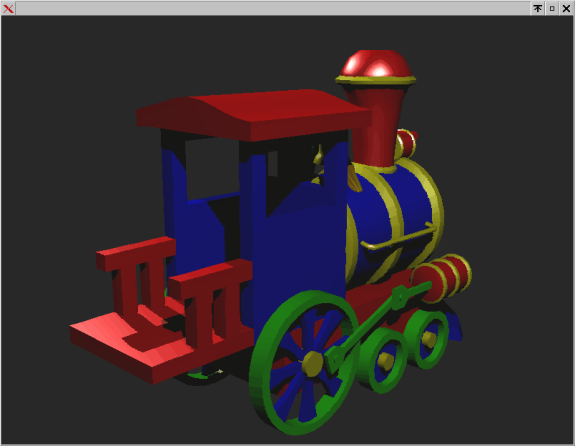 The train currently (Jan 8, 2011) spins at 21.5 frames per second, so I consider my goal of real-time rendering achieved. To put it in perspective, the "pure" C++ code - occupying 100% of both cores of my Core2 Duo (via OpenMP), clocks the same object at 4-5 fps. Update, one month later: The new implementation with the Bounding Volume Hierarchy is a lot faster, and has more features (reflections, anti-aliasing, run-time selection of features (via C++ templates), etc). Will CUDA help you make your code run faster? Some algorithms (like rasterizing) depend on large memory buffers, accessed in a random pattern. These will not work efficiently with CUDA, unless you can change your algorithm to perform the random accesses in the fast (but small, only 16KB!) shared memory, and then "flush" the output results to the main (slow) global memory, sequentially. If no random accesses to global memory are done, algorithms can greatly benefit from the many threads offered by CUDA - my Phong raycaster became 15 times faster. There's another catch, though: the code executed by each thread must follow the same paths (the same "if" decisions taken). Otherwise, you may find you are running slower than on a CPU. Try using textures to store your lookup data, since textures offer cache (a small one). Finally, make sure you find the optimal number of threads per block to use, via simple benchmarks. If your algorithm has additional configuration parameters (like mine, the bin grid size), benchmark that as well. Note 3: After the posting to Reddit, one of the comments pointed to a presentation given by Brad Peebler of Luxology, about CPU vs GPU rendering. They are of course using tremendously more complex algorithms, but their conclusions match mine: the more complex the algorithm, the more divergent, the harder it becomes to improve speed with a GPU implementation. A dragon... in C++ and in CUDA. (Deprecated) the source code for the "bins" based raycaster that was described in this article (latest version: 1.1, January 9th, 2011). Update: the source code for the new BVH raytracer (latest version: 2.1k, December 2015). This is a complete raytracer, much faster than the preliminary "bins" version, with more features (reflections, anti-aliasing, etc). Update: Win32 binaries of the new BVH raytracer, with 2 sample objects. And you will see a chessboard with reflections and shadows rotating, like the video shown on the top of this page. Right-click on "cudaRenderer" in the Solution explorer, and select "Properties"
You should see a rotating chessboard... Read below for keyboard control intructions, or just press 'H' for help. Note: I used the free Visual C++ 2008 Express Edition, but this should work with the commercial one, too. Hit 'R' to stop/start auto-spin. Use the cursor keys, 'A' and 'Z' to pilot. Don't be afraid to press multiple keys together. Rotate the light with 'W', 'Q'. 'S' and 'F' are 'strafe' left/right, 'E' and 'D' are 'strafe' up/down. (strafe keys don't work in auto-spin mode).